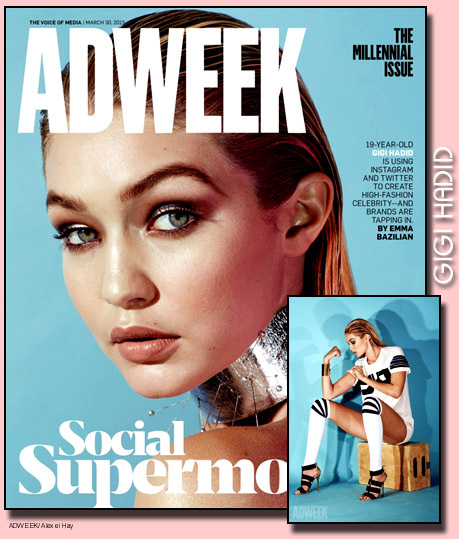 The explosive career of Gigi Hadid lands her on the cover of Adweek. The model of the moment talks about her social media success and plans after modeling. Inside the issue Gigi can be seen in a beautiful spread shot by Alexei Hay. The cover looks incredible although we have the disagree with the "Social Supermodel" title. Yes social media can give you boost to land gigs, but it can not make you a supermodel. It all comes down to the old saying "You either have it or you don't." Girls that are being pursued and landing top modeling jobs because of their social media followers over their modeling abilities, will find a very short career when the hype is gone. Gigi on the other hand was destine to make it to the top of her career, even if social media did not exist. The camera doesn't capture your social media following, it just simply shows the truth.